The ▀Pz.Kpfw. M4 748 (a) is a gift Rank II German medium tank with a battle rating of 4.0 (AB) and 3.7 (RB/SB). It was available only for pre-order during the Closed Beta Test of Ground Forces during the period before Update 1.41. 500 units were also for sale during the 5th Anniversary event, which sold out within a few hours. It represented a captured M4A2 Sherman in Wehrmacht service and was the first Sherman to be implemented in the game. Unfortunately, it is currently impossible for a new War Thunder player to acquire this rare tank. The M4 748(a) plays like any other M4 Sherman as a mobile tank with adequate armour and gun. While its frontal armour and gun may not be up for the tasks against its contemporaries at its battle rating, the M4's mobility allows the M4 to get around the front line to capture the objective or hit the enemy in the sides. Though, if the heavy maneuvering is not preferable, the M4 can also perform well as a supporting tank by backing up a more powerful tank to overwhelm a small enemy group. Visually, the M4 748(a) is identical to the M4A2 Sherman. 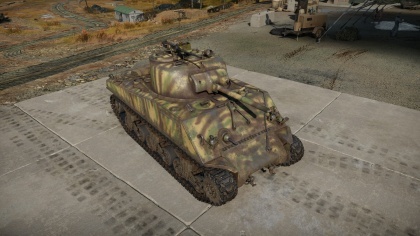 The only big distinctive feature of the M4 748(a) is the paint coat on the tank, which is a combination of the yellow dunkelgelb, red-brown rotbraun, and green olivgrün, in a manner similar to the default scheme of the Panther G.
Features on the M4 748(a) are shared with its counterpart with a 47° front armour plate with a one-piece transmission housing. The turret features the M34A1 gun mount with the 75 mm M3 gun, the mount specified for a telescopic and periscopic scope. Unlike the M4 Sherman model that has the same gun mount, the right turret side does not have a welded piece of applique armour, allowing for a more sloped contour on the 76 mm turret armour. The turret top features a spotlight on the front loader's position with his oval hatch while the commander has a usual split hatch with a M2 Browning machine gun for him to use. Small applique armour are placed on the side hull armour over ammunition that gives an extra 25.4 mm. Belly armour is 19.5 mm thick, though the tip near the transmission is 38.1 mm thick. Hull underside over tracks is 9.5 mm thick. A 9.5 mm RHA plate separates the engine compartment from the crew compartment. The M4 748(a) is a very versatile weapons platform that can be used in multiple roles and tactics. It can use its decent armour and gun to support friendlies against enemies, use its mobility to outmaneuver and exploit undefended location to reach an unsuspecting area, and a combination of the traits to deal with its contemporary medium tanks with the 75 mm gun with its APCBC and APCR ammunition. While most tanks in the BR range of the M4 748(a) are quite capable of destroying the tank through the front, the most worrisome tanks are those that are quite immune to the 75 mm gun on the M4. APCR ammunition is give to the 75 mm gun, but its poor slope characteristics still make it a situational ammunition than a universal tank annihilater. As such, exploiting side armour and general weak points of opposing tanks are still a must. The M4 748(a) tank's mobility can be used to travel the distance on the battlefield in an satisfactory fashion. As the M4 748(a) cannot stand against the more heavily armoured and armed enemies at the higher BR range, a maneuver around the enemy force or in a location prime for an ambush location can allow the M4 Sherman to damage or destroy enemy tanks. The engine power allows the M4 to travel across rough terrain to get to its destination. The only drawback in this action would be an unexpected encounter with another enemy trying the same maneuver, which would be a enemy tank class of equal to the M4 or lower so a good engagement against them could let the M4 continue its merry way. There are many instances on a War Thunder battlefield where two opposing tanks face off against each other on a corner of cover, waiting for the other to pop out so it can deal a crippling blow with its gun or waiting for the other to prematurely fire so it can advance unhindered to a prime firing location. The M4 748(a) can alleviate this problem by giving the friendly tank an additional support. In this scenario, go around the enemy through another angle while the teammate keeps the enemy busy. This way, the M4 can go around and prepare itself for a firing solution on the enemy tank. This will either end with 1) a successful out-maneuver and the M4 landing a shot on the enemy's side and weak point while it was preoccupied with the ally, or 2) the tank is forced to turn its attention to the M4, leaving your ally able to advance and do the same to get on the enemy's side. On a larger battle scale with multiple allies and enemies, work in cohesion with the others behind the front lines as the allies absorb most of the enemy shots, allowing the M4 to line a perfect shot on a spent enemy to land a penetrating shot into the hull and knocking out the crew. Always aim for a crippling or defeating blow so that the enemy tank will not be an immediate threat to the rest of the team while it repairs or replenish. While not as fast as some of the lighter tanks at the BR, the M4 748(a)'s upgraded mobility makes it usable as a vehicle to run towards the objective and capture the zone. It has the decent firepower and armour to handle enemy light tanks that are expected to also rush towards points, and so it could last for some time capturing and defending the zones. However, once heavier tanks and contemporary medium tanks start arriving in droves, it is recommended to start withdrawing from the position or else the M4 will be overwhelmed and destroyed at the first priority due to being an easy target, even if allies are present to support the M4 on the position. Fast and mobile vehicle due to powerful engine. Familiar M4 Sherman playstyle in the German tech tree. In the midst of the battlefield in World War II, wreckage and broken down equipment are often left behind by the army on the field due to either the inability to recover them or they are no longer operable. These equipment, if salvageable, are often taken by the occupiers and used for their own purposes. The Allies mostly captured German vehicles for use in gun tests and target practice, with the Soviets going as far as fielding captured tanks in their own ranks such as the Panzer III as the T-III. The German forces also captured Allied tanks as well, mostly fielding them in the Panzer forces to supplement the growing attrition of their armoured forces. The M4 Sherman, one of the most common tanks in the Allied forces, was often captured and fielded by the German forces. The fielded Shermans in the German army was given the designation M4-748(a). It is unknown exactly how many Shermans have been captured and used by the German forces during World War II, but the German-captured Shermans have been documented in the battlefields of Tunisia, Italy, France, Soviet Union, and in Germany itself in the last days of the war. The Shermans were reported to be used in the 14th Panzer Division, 16th Panzer Division, Fallschirmjäger Division, and Kampfgruppe Berlin. When used by the Germans, the Shermans were often painted with Balkenkreuz cross symbol of the Wehrmacht to distinguish between friend and foe. The German captured M4 Sherman's most notable combat performance was in the Ardennes Offensive in December 1944, the Baltic Offensive against the Soviet Union in late 1944, and the Battle of Berlin. The Shermans were also reported to play a role as armour-recovery vehicles rather than tanks due to the Sherman's great power-to-weight ratio and reliable design that allows for the ability to tow the heavier German vehicles reliably. The tank was available during the Closed Beta Test for the initial implementation of Ground Forces in a pack. 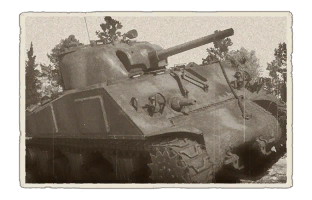 The M4 748(a) was available to be bought for 49$/€ as a standalone and 99$/€ for both this vehicle and the T-34 (Prototype). The tank was made available almost five years later as part of War Thunder 5th anniversary during the store discount period, with 500 up for sale alongside the T-34 (Prototype) for $59.99. This page was last edited on 26 March 2019, at 06:40.